Freddy Kiaie ’18 (near) hugs Jack Honeyman ’19 following the Knights 4-0 loss to Urban last Friday at Beach Chalet. The Knights finished the regular season with a record of 9-2-3. Knights lose to Urban in championship game, 4-0. 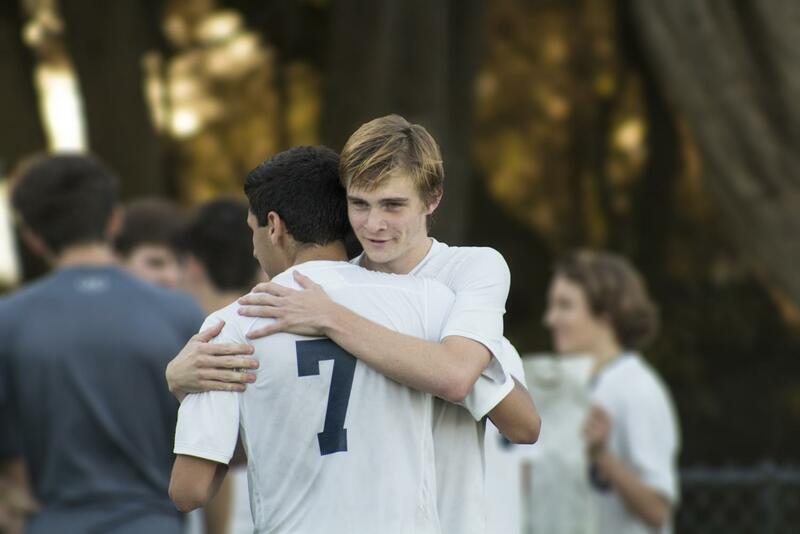 After one of the most successful soccer seasons in Stuart Hall’s history, the Knights bid for the BCL West Championship ended in consolatory embraces. In front of hundreds of fans at Beach Chalet, The Hall fell to Urban 4-0. From the outset of the game, Urban controlled the tempo. Their persistence eventually earned them a penalty kick, which they used to take a 1-0 lead early in the first half. The Knights continued to try and attack the Blues’ defense, but their advances broke down near Urban’s penalty area as the swarming Blues prevented many shots on goal. Urban continued to pressure the Knights’ defense after taking the lead and scored two goals for their efforts. The first goal came on a header, quickly followed by a powerful strike inside Stuart Hall’s penalty box. By halftime, the Knights trailed 3-0. Stuart Hall regrouped at halftime and put together strong attacks to begin the second half, but could not muster a goal. The Knights’ best chance came on a penalty kick. Medina blasted a shot to the bottom-right corner, but it was saved. Urban cleared the ball, and the Knights best opportunity at a goal slipped through their fingers. Urban was quite physical in the midfield, but the Knights showed poise and focus as they played through the contact. “Urban was one of the more physical teams in our league, but their physicality was not too much of an issue for us,” Kiaie said. With only a few minutes left, Urban’s Aidan Ryan ’18 broke through the Knights’ defense to score Urban’s fourth goal of the contest. Ryan celebrated with a front flip as the Blues all but solidified their 4-0 victory. The Knights had tied Urban in their first encounter of the season but lost their regular-season matchup by a score of 3-1. The Blues are the defending North Coast Section champions and are currently ranked second in the state. The Hall now looks forward to NCS, where they will contend for the first championship in school history. Because of the single-elimination format in the NCS tournament, every game moving forward could be the last for the seniors on the team.